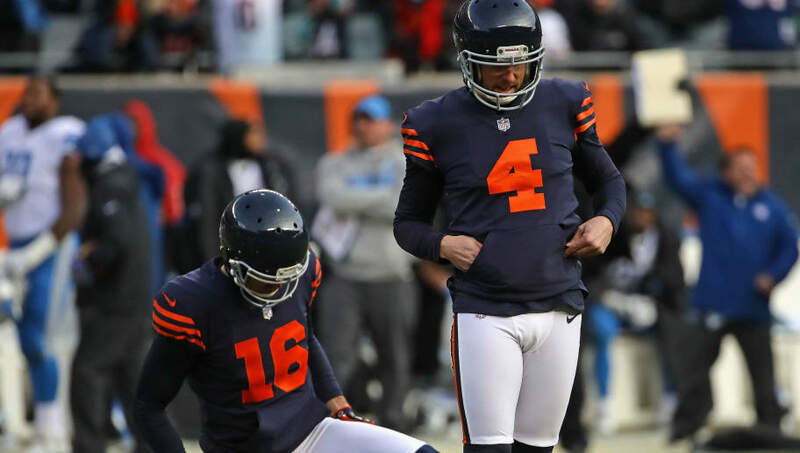 ​We don't doubt for a second that Bears punter Pat O'Donnell deserved​ his contract extension as he is one of the best punters in franchise history. However, the following stats prove that O'Donnell might just be the root of the problem in regards to Chicago's apparent field goal kicking struggles. With the five-year veteran as the Bears placeholder, Robbie Gould, Connor Barth, and Cody Parkey's percentages are all considerably lower with him holding than without him. ​​Gould doesn't represent a significant drop in conversion rate but Barth and Parkey!? How is that even possible? Does this prove that it is all O'Donnell's fault? If not, maybe these stats will persuade you. For O'Donnell's career his kickers are 94-120 on FGs for a 78.3%. Without him they are 531 for 609 for an 87.2%. O'Donnell's holding is a net -8.9%. That doesn't take into account the difficulties of kicking at Soldier Field but Gould had his worse numbers in Chicago with POD. Not to mention that opponents success rate is 12.5 percent higher than O'Donnell's kickers...even at Solider Field. Even at Soldier Field, opponents' success 12.5% higher than POD kickers. Zimmerman goes on to say that O'Donnell has been the one, lone constant in the Bears kicking game over the years, acknowledging the fact that the franchise has seen changes to special teams coaches, head coaches, long snappers, and kickers since O'Donnell joined Chicago in 2014. Let's hope the current Bears coaching staff becomes aware of these concerning stats and that they at least attempt to rotate potential replacements when training camp begins.